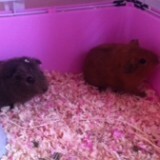 Due to popular request, here are a few photos of our pet sitting service. We dog sit or cat sit in your own home allowing you peace of mind that your pet will be at home in their usual environment rather than in a kennel or cattery. Here at sitmyhouse we love all animals whether large or small and here is a small selection of those we have looked after this year. 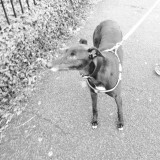 Crystal the greyhound has used dog sitting services on a number of occasions and is firm favourite with her pet sitter. She loves her walks and home comforts and can often be found wagging her tail enthusiastically in her sleep as she snoozes. Ever heard of a Jug? 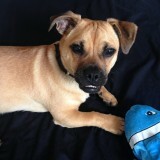 Jack is an amazing cross between a Jack Russell and a Pug. He has boundless energy and can walk for miles, but when he’s finally worn himself out, he loves nothing more than cuddles on the sofa with his pet sitter. 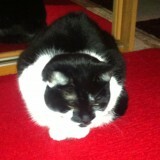 The beautiful Mog, who is currently the oldest cat we have looked after at the grand old age of 19. 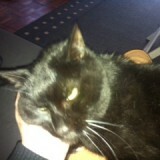 Mog likes nothing more than cuddles, strokes and lots of attention from her pet sitter and she certainly gets it. 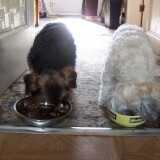 Two of our regulars dogs Mollie and Max, loving their dinners. Mollie the Bischon/Llhasa cross rules the roost and Max is more than happy to let her. At 18 years old, Cleo is the second oldest cat sitmyhouse has provided pet sitting services for. All she wanted was lots of cuddles and we were happy to give her lots! 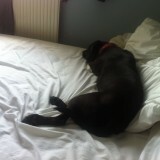 Sonny the Lab / Staffy cross dog liked sleeping on his owner’s bed when he wasn’t on his walks and he wasn’t going to move for anyone. 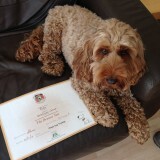 It’s not just dogs and cats we sit for, we love all pets! These two adorable Guinea-pigs called Lilly and Poppy were visited in their own home twice a day for 2 weeks, whilst their lucky family went to Disney World. Eve is a true princess cat and sitmyhouse have been lucky to look after her on a number of occasions, Her unusual markings are stunning and she is a delight to look after. 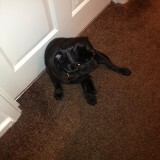 You’ve seen the Jug, now meet Withers the pug. He is a very cute, energetic little boy who we love dog sitting for. 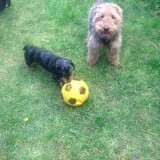 Woody and Louis, two beautiful brothers, full of personality who just love to play with their dog sitters. Want to see more? Why not subscribe to our You Tube channel where you will find videos of some of the gorgeous cats, dogs, puppies and kittens that use our pet sitting service.